. . . . . . complete performance packaging for electronic data storage devices! New technologies demand new security solutions. Computer hard drives, cell phones, PDAs and other data storage devices are playing increasingly important roles in criminal and civil evidence collection as well as corporate data storage. The Alert Antistatic Tamper Evident Evidence Bag delivers complete protection for data storage devices: Static shielding protection in a tamper evident package with chain of custody tracking. Alert Antistatic Evidence Bags are designed with the state of the art technology for tamper evidence and tracking. Features range from sequential serial numbering of the bags and tear off receipt to the unique Alert Continuous Security roll form which maintains the serial numbers of each Alert Security Bag in numerical order - a valuable tool for coordinating and maintaining multiple samples or chronological archiving of electronic devices. The maximum security tape closure system signals a positive, irreversible (VOID) message if tampering or re-entry occurs. For details on the security features of the Alert Antistatic Security Bag click the bag to the right. Security also extends to positive static protection for electronic devices. The Alert Antistatic Evidence Bag is constructed from a transparent "metal in" static shielding material. This state of the art material is a sophisticated lamination of Polyester / Metal / Polyethylene. 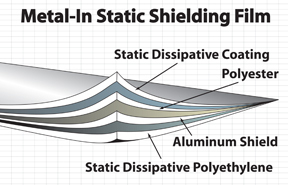 The polyester dielectric in combination with the encapsulated metal layer provides a Faraday Effect shielding of an Electrostatic Discharge (ESD). The metal layer prevents the penetration of damaging electrostatic fields and tribocharging is minimized by the specially processed polyethylene. Mechanically, the multiple layer construction provides a durable, puncture resistant package. Bags are printed with the ESD Warning symbol. Click the image to the right to view the details of the information block. 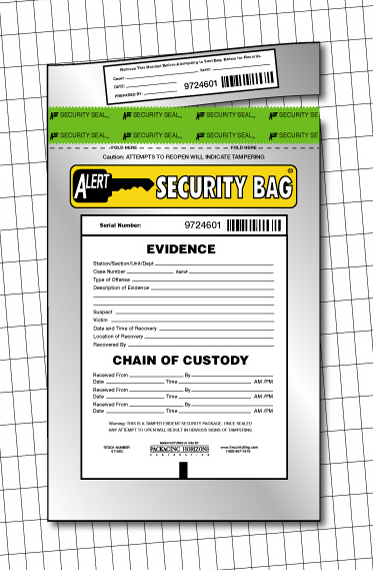 The Alert Antistatic Evidence Bag is also available in custom prints for corporate identity and specific use formats. Customer Service Representatives are always available to discuss your specific requirements. 1-888-467-1916, ext 10. 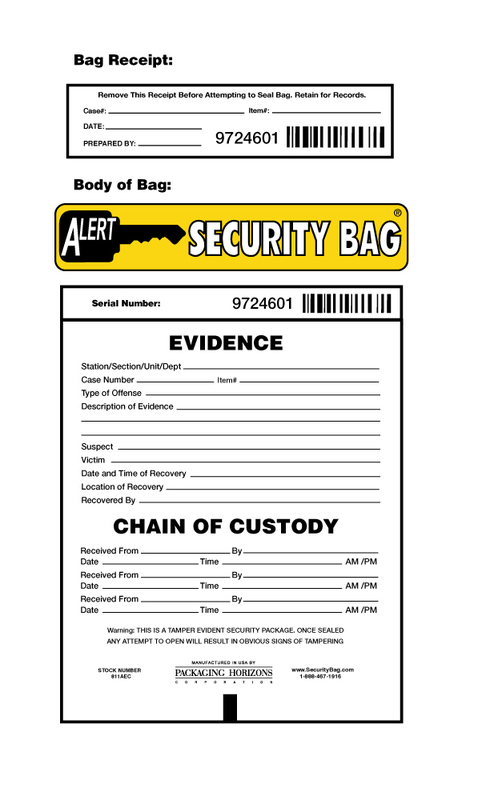 Alert Antistatic Evidence Bags address the growing issue of securing data storage devices. The broad user base ranges from law enforcement and forensic applications to banking and accounting. Samples of the Alert® Antistatic Evidence Bag are available free of charge for your evaluation. Our 6 in. x 8 in. and 8 in. x 11 in. products are sized for hard drives, memory sticks, etc. Also, we offer a 13 in. x 17 in. bag which will be suitable for most laptops. Please note that all of our products (including any customized items) are only accessible in the shopping cart. To view all products, please click on this link and login. If you have not registered, the shopping cart will provide you with the opportunity to establish a user account.